Campaigners in Sleaford have joined thousands up and down the country holding events to demonstrate their support for an ‘out’ vote in June’s referendum on an exit by Britain from the European Union. Thousands of ‘Brexit’ supporters across the UK held a Super Saturday national day of action on Saturday, March 12, under the Grassroots Out umbrella campaign urging voters to leave the EU. 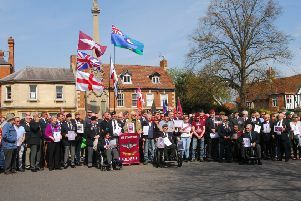 Supporters in Sleaford staged their event the following weekend, on Saturday, with a stall on Sleaford Market Place. The Grassroots Out message is that Britain would be better off leaving the EU. Rodger Doughty of Heckington, is a member of the campaign and was joined by fellow activists on Saturday on the market, but he said public turnout was fairly poor. But he said their stall will be on the next Farmer’s Market on Saturday, April 2, and on the St George’s Day market event. He said the campaign sees backing from a cross section of parties.